Researchers from the University of Southampton have helped to develop a new web application for gathering evidence during natural disasters, which will enable more effective emergency response. Accurate information can be life-saving in extreme situations, such as earthquakes and tsunamis. However, finding out the accuracy of that information from the vast amount of contradictory material that is posted on social media channels is becoming increasingly difficult. While such channels are useful for identifying and sharing content, they are not the right tools for verification, which requires searching for evidence rather than liking or retweeting. Verily (http://www.veri.ly/) has been designed by researchers from the University of Southampton, Masdar Institute of Science and Technology in the UAE and Qatar Computing Research Institute (QCRI) to rapidly crowdsource the verification of information during disasters. To test whether the platform would be effective, researchers designed the Verily Challenge to prove the feasibility of timely verification. Various questions were posted to www.veri.ly/crisis/1 and users were invited to submit evidence justifying their answer. A user could not simply submit a ‘yes’ or ‘no’ for an answer. Instead, they had to verify their position by providing evidence either in the form of an image or video or as text. For example, this photo of a street was posted with the question: Is this street in Rome. The photo was taken from a personal archive and was actually in the Italian town of Caltagirone in Sicily. 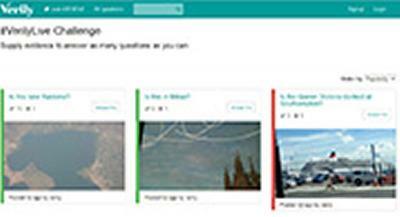 The question was answered correctly within four hours by a user who submitted another picture of the same street. - Foto Forensics helped ascertain the location of a skyscraper. - Google Earth confirmed a Greek lake photo. - Personal memory or extreme searching skill helped determine the location of this window display. - The location of a concrete robot with a heart was identified through a creative Google query. The success of the challenge confirmed the feasibility of rapid evidence collection. The next step is to deploy Verily for evidence collection during a humanitarian disaster. Victor Naroditskiy, a research fellow in Electronics and Computer Science at the University, who helped to create Verily, says: “The lack of verifiability of content posted on social media is the main reason preventing humanitarian and news organisations from making a wider use of it. Verily was invented by Carlos Castillo (QCRI), Patrick Meier (QCRI), Victor Naroditskiy (Southampton) and Iyad Rahwan (Masdar). The technical development of the platform was by Masters students Luis Arenal Mijares, Alex Greenland and Dimitrios Papamiliosin from the Web Technology MSc programme at the University of Southampton led by Enrico Costanza and Victor Naroditskiy. Justine Mackinnon (QCRI) together with the Southampton team organised the public trial of the platform. Victor and Enrico research crowdsourcing in the context of ORCHID, a multidisciplinary EPSRC-funded project developing the science and technologies for human-agent collectives, with disaster response as a key application area.